The Franco-Flemish town of Saint Omer was besieged for nearly two months during the Thirty Years’ War in 1638. This siege is one of several commemorated in prints intended for a French market by Stefano della Bella. Since the siege took place before della Bella’s arrival in France, he must have worked from a map supplied by someone else; an explanatory key at left details the locations of various events of the siege. 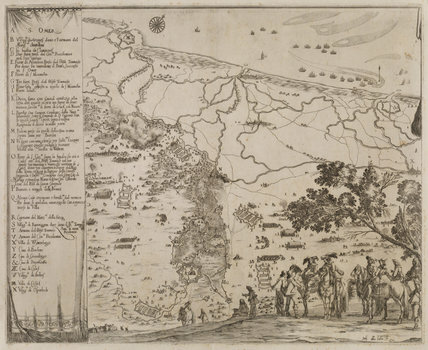 At lower right, Prince Tommaso of Savoy and his officers study a plan of the area.